RECIPE TITLE "Fresh Corn Tamale Casserole Recipe"
This half-sweet/half-salty casserole is typical of Hermosillo, Sonora. 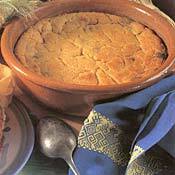 At grandfather Yzabal's house it was always made in a cazuela and served as an accompaniment to the main dish. Preheat the oven to 350 degress F.
In a food processor, process the corn and cheese until smooth. With an electric mixer, beat the lard for 5 to 7 minutes until light and fluffy. Add the corn mixture and beat for another 2 minutes, adding the salt and baking powder at the end. Butter an 8-inch cazuela, or any ovenproof dish with high sides. Divide the mixture into 2 parts, adding the sugar and raisens to one of them. Spoon this mixture into one side of the mold. On the other side, spoon half of the corn mixture, then the shredded cheese and chiles, then the remaining corn mixture. Bake in the oven for 1 hour, or until a knife inserted in the center comes out clean. 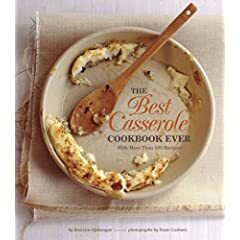 "Everybody who grew up on tuna noodle casserole or macaroni and cheese remembers that bubbling dish brought to the table with its top dappled golden brown, piping hot and inviting. My passion for casseroles was born from memories of my childhood and my mother's lasagna, thick and rich and gooey and delicious. 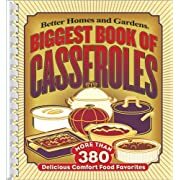 But once I had three children of my own, casseroles were the solution to many frenzied nights. We all loved the simplicity, ease, and satisfaction of a well-baked casserole. One of my favorite dessert casseroles was the Pear Crisp my kids and I made in late August when our pear tree was groaning from the weight of those luscious orbs ripening. We'd cut them up and arrange them in a casserole with cinnamon and then blanket them with a streusel made of flour, butter, and sugar before baking until bubbly. Hey, what a great name for a book!" This book offers an incredible value to consumers—featuring more recipes than any key competitor. Simple-to-make family meals including tried-and-true classics and updated exciting new flavors. Soul-satisfying casserole recipes perfect for everyday dinners, brunches, and casual gatherings. Special potluck chapter of crowd-pleasing comfort food, plus toting instructions with each recipe. Helpful advice to make-ahead, re-heat, and freeze one-dish meals for convenience. 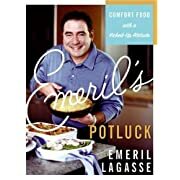 Emeril's Potluck brings together everything Emeril loves most about cooking and eating. The food is simple, flavorful, and perfect for sharing at any get-together. Each recipe serves a whopping 8 to 10 people, but don't assume you're making too much -- everyone will be heading back for seconds and thirds of these Emerilized starters, entrees, drinks, sides, and desserts. Start by toasting the occasion with a glass of Champagne Punch, a Watermelon Daiquiri, or an Orange Emeril. Then let the feast begin! Classic Blue Cheese Dip, Alain's Sweet and Spicy Asian Wings, or Sausage-Stuffed Mushrooms will get your party started right! Main courses range from Olive-Stuffed Leg of Lamb and Creole Mustard and Herb-Wrapped Beef Tenderloin to homey favorites such as Charlotte's Lasagna Bolognese, Penne #224; la Vodka Casserole, and Tuna Tetrazzini. Of course, it wouldn't be a party without dessert, so save room for Chocolate Peanut Butter Pie, Strawberry Shortcake, and Emeril's Tiramisu.